This movie shows no mercy on my emotions. 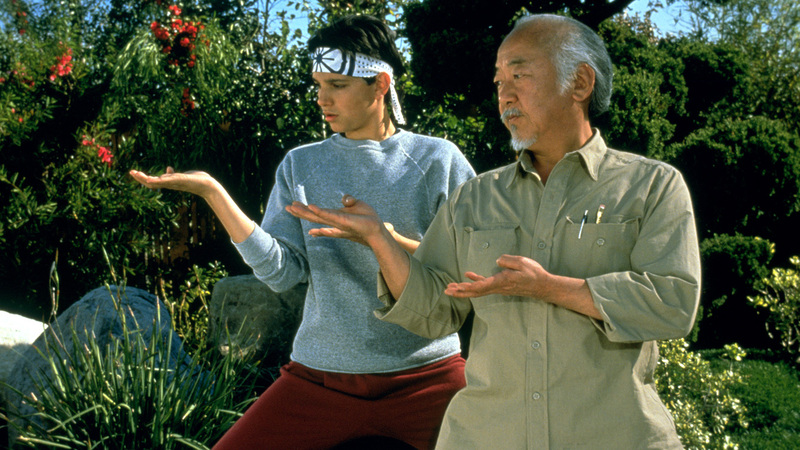 The Karate Kid is a deceptively simple title, one that befits a more ordinary movie. 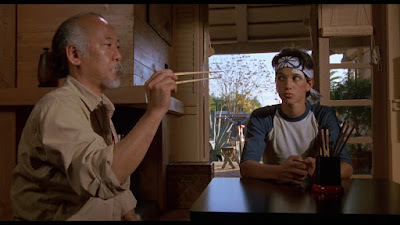 To me, The Karate Kid is not just a great sports movie but one of the great movies of the 1980s – one that I connected with as a child but one that tugs at my heart even more as an adult. In my most recent viewing of the film what struck me is how easy and professional it is as a piece of filmmaking. It flows. It has a certain grace. Mr. Miyagi (Pat Morita) preaches to Daniel Laruso (Ralph Macchio) about balance in karate and balance in life, but the subtext I so appreciate about The Karate Kid is that the movie is also about balance in acting, i.e. that mysterious force that creates actors chemistry with one another. You wouldn’t think an older Asian gentleman and a high-strung white teenager would forge a bond, a friendship like the one depicted in The Karate Kid, but the thing that makes the movie sublime (for me) is that both characters enhance one another’s lives – one in an obvious way (mentor-protégé) and one that’s not as obvious but slowly revealed throughout the course of the movie. As an added bonus, it’s known that the two actors forged a similar friendship when the cameras weren’t rolling. There’s a scene in The Karate Kid that always makes me cry. It’s the scene where Miyagi and Daniel are at Miyagi’s house, celebrating Daniel’s birthday with a cake and a couple of presents. This scene comes shortly after the “Oscar clip” moment where we learn Miyagi’s backstory – he fought for the Americans during WWII and lost his beloved wife and son due to complications in childbirth. That scene heavily informs the later scene that makes me cry. I cry when Miyagi takes Daniel outside and tells him to choose which of his cars he wants to have as a birthday present. It’s such an unconditional act of kindness that it strikes me right in my feels and puts the whole movie into focus. Daniel is Miyagi’s surrogate son; he is the last opportunity this previously disillusioned older man has to pass down his family’s teachings– namely aptitude in karate. Once Daniel gets into the car, the dialogue between the two men is perfect. Daniel tells Miyagi that he is the best friend he’s ever had and Miyagi replies (I’m paraphrasing) that Daniel is pretty okay too. Not only is this exchange perfect because it stays in Miyagi’s character of having a sharp sense of humor but also because he understands that Daniel is serious when he says Miyagi is his best friend, but Daniel is not necessarily Miyagi’s best friend. Miyagi has seen more life than Daniel, life that Daniel will soon experience. Miyagi’s best friend was probably his wife and Daniel has become something more important to him – family, which to Miyagi is more meaningful than friendship. On my favorite movies podcast, Patrick had the astute observation that he notices my love of the movie Silver Linings Playbook comes from the “moments in-between.” The Karate Kid is another one of those movies for me. A movie can sometimes become more than a movie to you and become your friend. It speaks to you as text and in the moments in-between. Everything about The Karate Kid works for me. I love that Daniel is a hot head and not a traditional weakling, I love Bill Conti’s lush and wistful score, I love that the main villain Johnny (William Zabka) has dimension and is not the villain in his own story. He’s just not as lucky in his choice of a mentor. 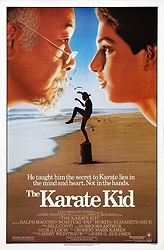 The Karate Kid was directed by the unsung John G. Avildsen, director of Rocky and Rocky V, as well as the subsequent two (entertaining but not as good) Karate Kid sequels. What I find so interesting in 2016 about the original The Karate Kid is how much of a mirror it is to 2015’s remarkable sports movie Creed. Creed is like looking at The Karate Kid if we had followed Miyagi over the course of seven movies instead of Rocky, or in this case, Daniel. I’m probably overthinking it, so I’ll end with something simple: The Karate Kid is a movie that makes me want to have kids so I can show it one day to my grandkids. It’s a source of light in an often dark world and it means the world to me. But how does Daniel win the tournament? He kicks Johnny in the face (a completely illegal move). Once someone pointed that out to me I can't not think about it. It's INTENTIONAL contact to the face, maybe it was deemed unintentional (as Johnny charged into him)? I often wondered the same thing, so that's the only plausible explanation. Great choice, and a moving write-up. I've got a lot of '84 movies to cram in before Saturday. Well written Adam. Your words sum up this essential 80's classic perfectly.